Join the fun that is needle felting with a convenient starter pack that has the tools you need to begin along with 5 pages of general tips and tricks of the craft. 10 pieces of 18" cloth covered 22 gauge wire perfect for armatures up to 6"
I just discovered needle felting a couple of weeks ago. I discovered Sara's tutorials on YouTube and became mesmerized. I promptly ordered this starter kit. I looked at other stuff on Amazon, but there were no cute felting surfaces, and I love the look of the Stabbit Wabbit. Fast delivery, and I loved the thank you note that was written on my receipt. I filled my stabbit with rice right away and started practicing. 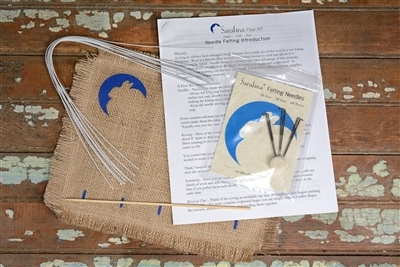 I'm in love with my new hobby and will definitely be purchasing more stuff from Sarafina Fiber Art in the near future. Sara, thank you for sharing your expertise and for the amazing products. I ordered this starter kit, some wool and the Fox Supply Pack. Everything was beautifully packaged and arrived quickly :) The Stabbit Wabbit is adorable and very well made, I am very happy with everything! Wonderful high quality products, I am excited to get started on my projects and will order again! Very happy with my purchases!